Deep in London's Chiselhurst lies the Sundark, a magnificent, mechanical manor built in earlier times by a master illusionist and his occultist wife. Its guests have been known to stay, only to never be seen again. Elle Black, a housewife and telekinetic is summoned to solve this mystery. The mystery surrounding the Sundark, with its mechanical dome for stargazing and beautiful witch's hat dome architecture is perfectly paced. If the home-turned-hotel didn't devour people and spit out their remains in the garden, I would be ready to move in. A bonus for me was when I realized that Elle Black lives in the same reality as Artifice, the artificial ghost, and Jim Dastard, the animated skull, from The Dark Victorian series. 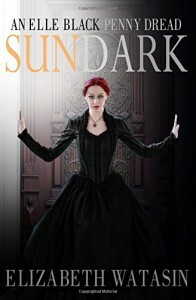 Their paths almost cross when a character from The Dark Victorian shows up in Sundark. This is a fast-paced, exciting read, that dives right into the mystery, with truly unique characters. My favorites, of course, are Elle and her wife, Faedra, who share a genuine love for one another. The twist at the end was brilliant, and I look forward to reading more of Elle's sleuthing adventures.